Distance, dry heat in summer months, steep climb, high speed descent and vehicular traffic. 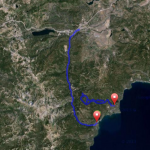 There are various locations to connect to this Loop – Tahoe City, Squaw Valley, Truckee, Northstar and Kings Beach are common launch spots. Clockwise direction is recommended. This is a good road training ride as it offers flats for sprinting on Hwy 89 (River Rd.) from Squaw entrance to Truckee turn off, a sustained 4 mile climb from just before Northstar up to Brockway Summit (7,199 ft.), and 3.3 mile descent to Kings Beach. From Squaw entrance Hwy 89 becomes a wide high-speed four lane road to Truckee. At 13.1 miles turn right on West River St. You have the option of stopping at Historic Truckee, or continuing along the river’s edge where you junction with Bridge St. and turn right. It’s a short steep climb and you’ll pass the Truckee Regional Park on the left and then Ponderosa Golf Course. At the Brockway Rd (Hwy 267) turn right and you will pass the Truckee Tahoe Airport, Martis Creek Lake on the left and the Martis Creek Wildlife Reserve on the right. At 19 miles, you will begin your climb with the summit at 23 miles. Caution is needed on the high speed 3.3 mile descent to Kings Beach at 26.3 miles. At Kings Beach there are a variety of services to refresh you – including beach access. Turn right on Hwy 28 (North Lake Blvd. 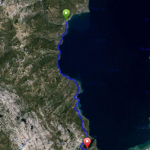 ), heading west, and you will ride on recently constructed bike lanes to Tahoe City. The first Trans-Continental Railroad, completed in 1869, offered faster travel across the country than covered wagons and wagon trains and was instrumental in opening the west for development. The train passed, and continues to pass, through Truckee where passengers could disembark and take the first road built, Brockway Summit (Hwy 267), to transport tourists from the train depot to the Brockway Springs Resort on the Lake. There is an actual hot springs in the Lake just offshore from Brockway. The road provided additional access for logging operations to harvest the forested area and deliver the logs a short distance to the mills in Truckee. The Northstar Ski Resort land was once owned by a logging company, Fiberboard.